MAKING VAGINAS FROM STEM CELLS, YES…ENTIRE VAGINAS, WORKING VAGINAS, ANATOMICALLY CORRECT IN FORM AND FUNCTION. WOW! “Four women have had new vaginas grown in the laboratory and implanted by doctors in the US. Research led by Charles Cox at the University of Texas Health Science Center has shown that stem cell therapy given during the critical time window after traumatic brain injury promotes lasting cognitive improvement. These experiments, which were published in the latest issue of the journal Stem Cells Translational Medicine, provide a pre-clinical model for experiments with larger animals. After the brain has suffered a traumatic injury, there are few treatment options. Damage to the brain can be severe, and can also cause ongoing neurological impairment. Approximately half of all patients with severe head injuries need surgery to remove or repair ruptured blood vessels or bruised brain tissue. In this work from Cox’s lab, stem cells from bone marrow known as multipotent adult progenitor cells (MAPCs) were used. MAPCs seem to be a subpopulation of mesenchymal stem cells, and they have a documented ability to reduce inflammation in mice immediately after traumatic brain injury. Unfortunately, no one has measured the ability of MAPCs to improve the condition of the brain over time. Cox, Distinguished Professor of Pediatric Surgery at the UTHealth Medical School and in collaboration with the Children’s Fund, Inc., injected two groups of brain-injured mice with MAPCs two hours after injury and then once again 24 hours later. One group received a dose of 2 million cells per kilogram and the other a dose five times greater. After four months, those mice that had received the stronger dose not only continued to have less inflammation, but they also showed significant gains in cognitive function. Laboratory examination of the brains of these rodents confirmed that those that had received the higher dose of MAPCs had better brain function than those that had received the lower dose. According to Cox, “Based on our data, we saw improved spatial learning, improved motor deficits and fewer active antibodies in the mice that were given the stronger concentration of MAPCs.” Cox also indicated that this study indicates that intravenous injection of MAPCs might very well become a viable treatment for people with traumatic brain injury in the future. Stem Cells Improve Cognition After Brain Injury | Beyond the Dish. A new study published in GUT (An International Journal of Gastroenterology and Hepatology) has shown that amniotic fluid stem cells can reverse intestinal damage in rats caused by necrotising enterocolitis — an often fatal disorder that afflicts premature babies. Paolo De Coppi had already proved that amniotic fluid could be reprogrammed in a similar way to how we reprogram embryonic stem cells, and without introducing potentially damaging genes to instigate the transformation (how adult cells are made pluripotent). Though not quite as versatile as the embryonic version, De Coppi showed that they could be converted into liver, bone and nerve cells. What’s interesting about this latest study is that the stem cells calmed the intestinal inflammation, healed and reversed damage done to the gut far better than bone marrow stem cells (used in a rate control group), and in an unexpected way. After being injected, the cells travelled to the tiny villi that line the intestinal walls and absorb nutrients, where it then released an unknown substance that triggered progenitor cells to calm the inflammation and instigate tissue and villi regrowth. The team is unsure exactly how it released a growth factor to kick the progenitor cells into action, but it’s hoping further studies could clear this up — that knowledge could then be used to develop drugs that replicate the same action. In the meantime, De Coppi says, “we hope that stem cells found in amniotic fluid will be used more widely in therapies and in research, particularly for the treatment of congenital malformations”. Necrotising enterocolitis is common in premature babies, with inflammation rapidly leading to tissue death and a perforated intestine if antibiotics have no effect. At that point, an operation is the only option and these have a 70 percent survival rate due to related risks of surgery at such a young age, and can leave infants with a shortened intestine and trouble eating for the rest of their lives. This latest study gives hope for an injectable, non-invasive solution. 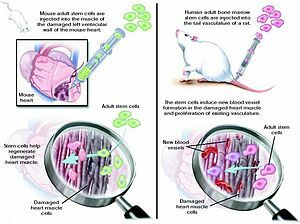 Stem cells have already been shown to have some incredible properties for regenerative medicine — most recently baboon embryonic stem cells were used to repair damaged arteries. However, due the ethical grey area embryonic experiments reside in, progress has inevitably been slower, with the first official human trials only recently beginning to take place. Stem cells derived from amniotic fluid have huge potential, but would mainly still rely on donors given the impracticalities of storing fluid from every birth. Nevertheless, according to estimates published in a 2005 study, just 150 donors would provide a match for 38 percent of the population. De Coppi, who in 2010 made headlines when he built an 11-year-old boy a trachea replacement from his own bone marrow stem cells, is currently raising funding for his research into building rejection-free transplants from stem cells. Jennifer Vasilakos got the shocking surprise of her life after helping a man who stopped to ask her for directions. That man happened to be the billionaire founder of the Beanie Baby company and what he did may have saved her life. NBC’s Kristen Dahlgren reports. What started out as a modest fundraising event held in a Santa Barbara, Calif., parking lot has turned into a life-changing moment for Jennifer Vasilakos, thanks to a chance meeting with Beanie Baby billionaire Ty Warner. It all began in a parking lot in July of last year. Vasilakos, 42, set up a table near her hometown’s annual Santa Barbara French Festival to raise money for stem cell treatment, displaying signs and flyers that explained her cause. She also brought a small moneybox to stash cash made from parking cars for festival-goers. Equipped with sunglasses, a water bottle and coffee, Vasilakos was prepared to spend the day raising awareness and telling people her personal story – that she was diagnosed with acute renal failure in 2011 and had received dialysis three times a day, three times a week. It was a grueling regimen that she would endure the rest of her life. A kidney transplant wasn’t an option; she had been rejected as a candidate because of a previous bout with cancer. Vasilakos, a Reiki teacher and herbalist, decided her only option was to save up for stem cell treatment – a costly procedure that is not performed in the United States. That’s when a lost driver in a “small little car” drove up, looking for directions. Jennifer chatted him up. The man gave her $50. About an hour later, the driver returned, looked her in the eye and asked if she was the woman in the flyer raising money for stem cell treatment. She confirmed that she was. Yes, that Ty Warner – of Ty Inc., the billionaire brain behind the Beanie Babies collectibles craze. Vasilakos said she recognized his name but had no idea he would ultimately make a huge donation. Warner, according to a prepared statement, was enlightened by their chance encounter. Vasilakos underwent the treatment in September 2012 and now, after months of recovery, she says she feels great. via ‘Brimming with energy’ after $20K stem cell treatment – The Daily Nightly. California‘s stem cell agency understands the importance of attacking chronic problems. So if it wants to survive beyond 2014, it should heed the Institutes of Medicine‘s advice to eliminate conflicts of interest on its board — and do it before awarding the remaining $1.2 billion of the $3 billion voters approved for stem cell research. The California Institute for Regenerative Medicine asked the prestigious Institutes of Medicine, the health arm of the National Academy of Sciences, to evaluate its operations. One of the findings was that the vast majority of the agency’s 29 board members stand to benefit in various ways from their decisions on awarding research grants. This has been suggested before, but the new report leaves no question of the ethical issue. To justify its continuation in some form, perhaps as a nonprofit or a foundation, the agency needs a majority of independent board members to make funding decisions. The stem cell institute’s public funding window closes in 2014. It commissioned the review in part to help figure out how it might survive after that to sustain progress in stem cell research. Even if there were no concerns about independence, another voter-approved bond would be out of the question. Long-term funding was never the intent when Proposition 71 passed in 2004. It was supposed to kick-start research at a time when federal funding was blocked and to establish California as a major player in the rapidly advancing medical field. Sweat glands have been historically known for their ability to regulate the core temperature of the human body and to secrete unwanted toxins. Recent research has discovered that sweat glands contain an abundance of stem cells and the potential to aid wound healing. Human skin is rich with millions of eccrine sweat glands that help your body cool down after a trip to the gym or on a warm day. These same glands, new University of Michigan Health System research shows, also happen to play a key role in providing cells for recovering skin wounds — such as scrapes, burns and ulcers. The findings were released online ahead of print in the American Journal of Pathology. “Skin ulcers — including those caused by diabetes or bed sores — and other non-healing wounds remain a tremendous burden on health services and communities around the world,” says lead author Laure Rittié, Ph.D., research assistant professor of dermatology at the University of Michigan Medical School. “Treating chronic wounds costs tens of billions of dollars annually in the United States alone, and this price tag just keeps rising. Something isn’t working.” Now, U-M researchers believe they have discovered one of the body’s most powerful secret weapons in healing. “By identifying a key process of wound closure, we can examine drug therapies with a new target in mind: sweat glands, which are very under-studied,” Rittié says. “We’re hoping this will stimulate research in a promising, new direction.” Previous understanding of wound closure was that new skin cells originate from hair follicles and from intact skin at the edge of the wound. The U-M findings demonstrate that cells arise from beneath the wound, and suggest that human eccrine sweat glands also store an important reservoir of adult stem cells that can quickly be recruited to aid wound healing. Additional authors include Dana L. Sachs, M.D. ; Jeffrey S. Orringer, M.D. ; John J. Voorhees, M.D. ; and Gary J. Fisher, Ph.D., all of the University of Michigan Department of Dermatology.